The other night, Emmett and I had my friend Annika and her hubby over for "Happy Hour." It was more like a tapas dinner that went waaaaay into a lovely, candle-lit evening under the two Chinese Elm trees in our front yard. It was one of those perfect California nights--both in weather and in company--that re-enforces our reasons for living here. It was such a delightful time that had it not been their first visit to our house, I would have suggested we grab sleeping bags, sprawl out in the front yard, talk until we fell asleep, and then enjoy a cup of coffee together in the morning before heading out for breakfast. But that would have been too weird to ask of them on a first date. And probably on a second one. And a third. In fact, maybe I shouldn't be writing about it at all. 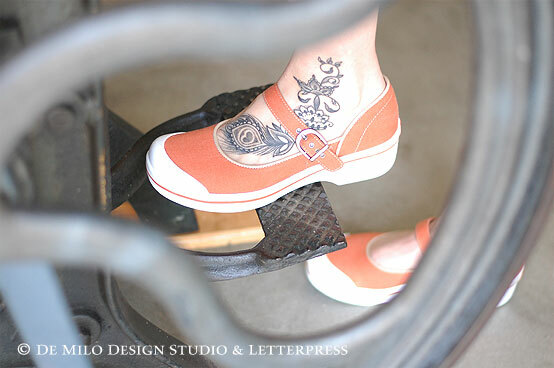 Upon their arrival, I noticed right away the tattoo on Annika's foot in the photo above. However, throughout the evening, our conversation went wildly in every direction ("They can talk about ANYTHING," Emmett marveled the next day) and I totally forget to ask her about it. Then I checked in on her blog and read the tattoo story here, which then took me here, where you can read a wonderful write up about why she got it done.